Learning how to make yogurt is a skill that will supply you with a wonderful, healthy milk product at a price that is greatly reduced from commercial products. Homemade yogurt is also more versatile, lacking added thickening agents and sweeteners used in store-bought brands. Homemade goat milk yogurt also provides you with all of the nutritional benefits of goat milk that you can read about in Milk Nutrition Facts for Goat Milk, along with the health benefits of yogurt. 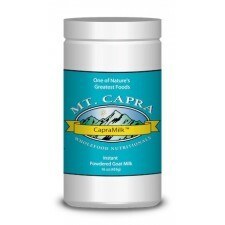 Lactic acid, in turn, lowers the pH of the milk, which inhibits the growth of harmful bacteria. Lactic acid gives yogurt its tangy taste, and also causes the proteins in the milk to thicken into a pudding-like consistency. You can sterilize the recommended quart canning jar by boiling in water for ten minutes. Leave the jar in the covered pot of hot water until ready to use. Alternatively, you can culture your yogurt directly in the pot in which you heat the milk, provided you have a large enough container for the pot during the incubation stage. Also, keep in mind that temperatures over 130 degrees Fahrenheit will kill the yogurt bacteria and cause your yogurt to fail. Warm the milk to 115 degrees Fahrenheit. It's best to warm slowly so as not to overshoot the temperature and have to cool it down again. If you are working with freshly pasteurized milk, set the container of milk in cool water and stir until the temperature comes down to 115 degrees. If you are using the powdered milk to produce firmer yogurt, stir it in at this time. Add the plain yogurt to the milk and mix well. A whisk works best. 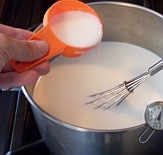 When thoroughly mixed, pour the milk into the sterile jar and close the lid tightly, or place a lid on your pot if you will be incubating the yogurt directly in the pot. Note: The oven acts as an insulator--do not turn it on. The warm water you use should be around 115 degrees Fahrenheit. If your tap water is not hot enough, an easy solution is to use a combination of the hot water in which you sterilized your jar, with enough cold water added to cool it to the proper temperature. Place the jar into the hot water and either cover and place into the oven, or close the ice chest lid, and leave undisturbed for 3-8 hours. When finished, the yogurt should have a thick, gel-like consistency. However, it will not be semi-firm like store-bought yogurt that has added thickening agents. You can save the last bit of yogurt from this jar as starter to make your next quart, etc., and have a never-ending supply of this delicious healthy dairy product. If the yogurt has not gelled within 8 hours, something has gone wrong. If you were careful to follow the procedures and carefully monitor the temperature, then the starter was probably bad. Purchase a new container, looking for the freshest possible, and leave sealed until you are ready to make your yogurt. It is also likely that amounts of culture differ from brand to brand, so you may want to try a different brand at this time. If you'll be making yogurt on a consistent basis, you may want to invest in a yogurt maker and some direct-set yogurt cultures. 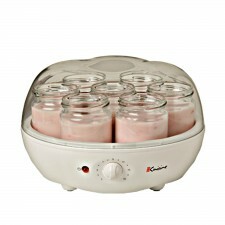 Our affiliate, Cultures for Health, has nine varieties of yogurt cultures and several styles of yogurt makers, including the Euro Cuisine Yogurt Maker shown below. Your purchase will give you the tools for a healthy treat, and will also help support this website! Click on an image below to view all the selections of yogurt makers and cultures. When your yogurt is ready, place in the refrigerator, and start looking up some great Yogurt Recipes for enjoying your delicious homemade goat yogurt! Articles are updated frequently, so check back here for any new information related to how to make yogurt!